For the fourth straight Octagon show, every fight on a UFC card will be made available for live viewing. 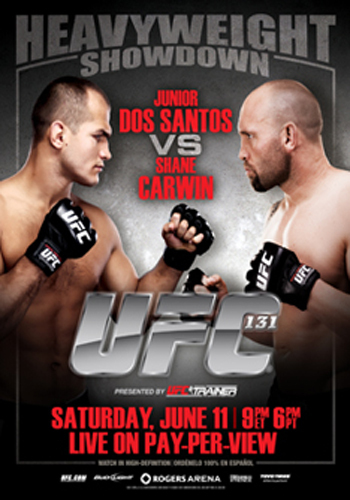 “UFC 131: Dos Santos vs. Carwin” takes place this Saturday inside the Rogers Arena in Vancouver, Canada. Facebook will kick off the festivities with five preliminary bouts at 5:50PM ET/2:50PM PT. Fanboys simply have to “Like” the UFC’s Facebook page in order to watch the scraps. Spike TV will broadcast a pair of live prelims immediately following the stream at 8PM ET/5PM PT. Unfortunately the freebie fights end there, as fans will have to pay for the goods when the pay-per-view begins at 9PM ET/6PM PT. Shane Carwin and Junior dos Santos will battle for first dibs at UFC heavyweight champ Cain Velasquez’s belt in the card’s main event. Brock Lesnar was slated to stand opposite 2Santos, but the former 265-pound champion was forced to withdraw at the 11th hour when his case of diverticulitis re-emerged.